As 2016 comes to a close many of us in the Grand Valley take a moment to reflect on where we were over the last couple of years, and then assess where we can make some progress in our local economy in the year(s) ahead. Many of us with math or engineering backgrounds remember a few key formulas which are used on practical applications. One formula that sticks in my mind has long-term implications for our local economy with a slight twist of the variables. That is; the formula for momentum; p=mv. In its application toward economic development P stands for the number of People (p) who are highly engaged in a Mass (m) effort to Move (v) toward job creation for Mesa County. Historically this formula applied to our recovery in the late 1980’s, and again is now essential to our recovery in this decade. To the credit of our community, many individuals have jumped on board GJEP committees to support outreach efforts in the areas of: health care, outdoor recreation, agriculture and technology, with a focus on business expansion opportunities that can build diversity in our economic base. Like the formula for momentum, these efforts gained both magnitude and direction in 2016. In addition to revitalizing these committees, GJEP has had measurable results in the Jump-Start Colorado program with seven different companies qualifying for this program. Support from local municipalities, Mesa County and CMU to further their efforts for job creation are underway. In addition to the support from GJEP’s municipal and county partners, the board has been very fortunate this year to attract new members whose business entities are major employers and economic drivers in the Grand Valley: Dr. Brian Davidson – Chief Medical Officer at St. Mary’s Hospital, Stacy Mascarenas – Foundation Director Family Health West, Sam Meyer – Vice President Shaw Construction, and Pat Tucker – Owner of Conquest Development. Future economic diversity and strengthening employment will continue to be found in the P (people) factor for the years ahead. GJEP staff members are doing a wonderful job working with the community’s ED partners, attending trade shows, responding to contacts from site selectors, completing detailed RFPs, and reaching out to the industries identified in the North Star location assessment and brand studies [spearheaded by the City of Grand Junction]. Economic development is much more competitive than in the late 1980’s but opportunities continue to exist for 2017 and beyond if we continue the efforts enacted this year, plus challenge ourselves to be part of the p=mv equation. Simply stated this means to proactively invite someone you know who may wish to expand, start up, or relocate to Mesa County. This may be as simple as an invitation to a supplier who may fit under the Jump-Start program, or a relative whose business aligns well with the Grand Valley culture, or listening to a high tech provider who is considering an expansion and wants to find an area with less travel concerns. Let’s be mindful of those opportunities in 2017 as our community has many unique attributes for both businesses and their employees. It has been an honor to serve as Chair of one of the most active economic development entities in the western region of the U.S., and the cohesive approach to growing our local GDP by all the partners has been most rewarding. I will leave with a charge to the community – be a Maverick when you have a chance, and invite a business contact to visit the Grand Valley when you are out and about! Who knows, your son, daughter or relative might just end up working for that company after it moves to Mesa County. Tom, the honor was all ours. Thank you for bringing your Maverick spirit to GJEP! 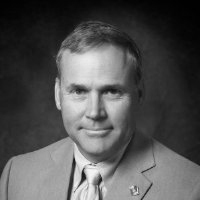 Tom Benton currently serves as acting director of the Maverick Innovation Center at Colorado Mesa University. He previously served in the financial services industry throughout Western Colorado for over three decades. He began with working with a small regional bank holding company and, through a series of acquisitions, concluded in being a team member of the nation’s largest bank – Wells Fargo. Tom has also been an instructor for a number of AIB courses and a small business owner for over 20 years. He studied agriculture economics and engineering at Colorado State University. Featured Image by Charity Meinhart: Outgoing chair, Tom Benton (second from left), with members of the current GJEP board.